We are hosting an all-star panel at our upcoming Multifamily & Apartments Investing Network (MAIN) event on April 6th. Leaders of NAIOP & ULI Charlotte chapters will be discussing the state of the local and regional commercial real estate market. The ticket includes admission, beer, and custom pizzas. 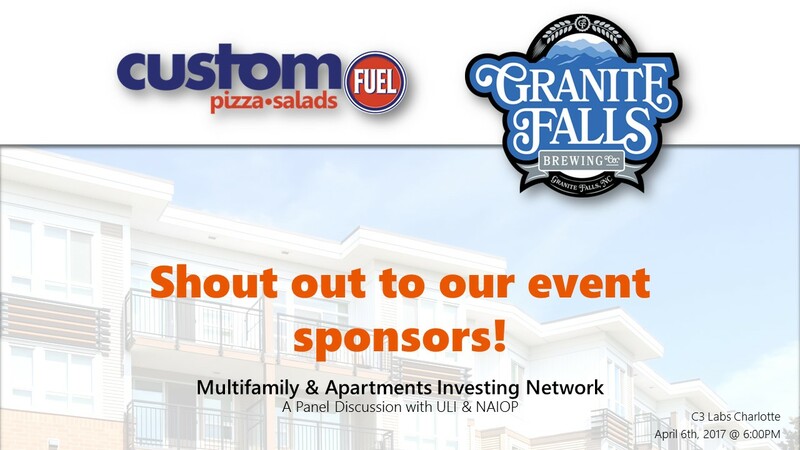 Our sponsors, Granite Falls Brewing and Fuel Pizza on South Blvd in Carlotte with be provide the craft beer and custom pizzas. Urban Land Institute is a 501(c) (3) nonprofit research and education organization supported by its members. How can you network with leaders of these national and global organizations? Our three panelists who will be speaking at our upcoming MAIN panel discussion are heavily involved in NAIOP & ULI. Brendan Pierce serves on the board of directors of NAIOP Charlotte as President. He is Director of Office Development, Acquisitions and Leasing at the Keith Corporation(TKC) and has over fifteen years of experience in the commercial real estate industry. He is responsible for sourcing development and acquisition ventures throughout the United States. In his career, Brendan has developed and acquired over 1.2 million square feet of commercial real estate valued at $550 million. 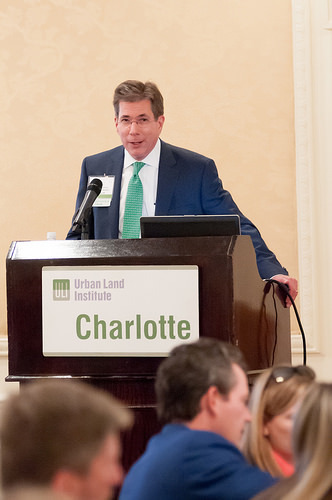 Rob Cochran is the current Chair of the Charlotte District Council of ULI. He is also a senior managing director of Cushman & Wakefield where he is the leader of the Charlotte Capital Markets team and has more than 35 years of experience in the Carolinas real estate market. For the past ten years, he has focused on investment sales in the Carolinas. He is a past president of the Charlotte Region Commercial Board of Realtors and the boards of Communities in Schools, Ronald McDonald House, and Children & Family Services Center. Theresa Salmen is heavily involved in the commercial real estate network in Charlotte. She serves as Executive Director of NAIOP Charlotte and Executive Director of ULI Charlotte. Theresa Started TH Mgmt., Inc. in 1991, an association management company (AMC). She has earned her Certified Meeting Professional (CMP) designation and was recognized by the Charlotte Business Journal as one of the top Women in Business for 2005. She is a past president of the Association Executives of North Carolina Charlotte Chapter and previously served as a board member for the AMC Institute (trade organization for the Association Management Company industry). Also check out our MAIN Fireside Chat with Tony Azar to see photos from our sell out event last month! NAIOP is hosting its NC statewide conference on March 30-31 in Pinehurst, NC. Find registration information on the NAIOP Charlotte website under the upcoming events tab. The conference is open to members and industry guests. ULI is hosting its 4th annual Carolinas’ Meeting on March 23 and 24 at the Westin Charlotte. It is expected to draw more than 600 attendees from across the region. Find more information about the event at the ULI Charlotte website under the events tab. The event is open to members and nonmembers.